Over the weekend on our family trip to Albany, four of us set out on bicycle ride to the Thatcher Park overlook. From this vantage point you can see for miles into the Hudson Valley, and points north. Previous trips had always been by car, which made us seriously under-appreciate the change in elevation. By the first hill of our ride, I have to admit I was pretty gassed. Heading out of Albany on New Scotland Avenue is all downhill until you hit the Normans Kill Creek, at which point the next 12 miles are, for the most part, straight uphill. Part of me realizes that I was literally just returning home from a 5.5 mile jog with Ellie when the bike riders found us and said go grab your bike, so my legs were already tired. The other part of me realizes that we did 1900 feet in climbing, some of which was at a ridiculous grade. But i’d be a liar to say that I wasn’t disappointed with my level of fitness and how much I struggled with it. It is difficult to be the trailing rider at every segment of the ride, catching up just in time for everyone to set off again. It was a humbling experience. 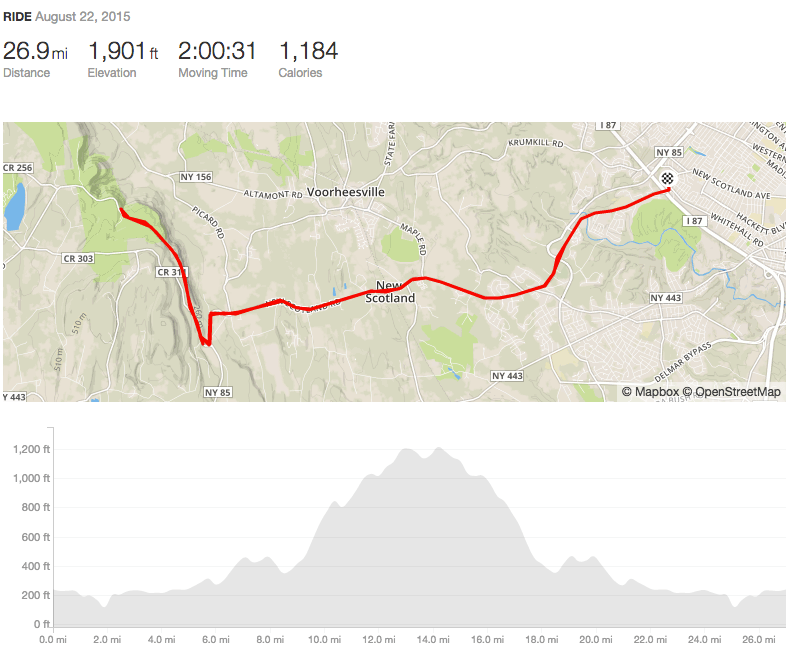 I enjoyed it overall, and it was great to get back on the bike for another long ride. The stubborn part of me wants a rematch, to see if I could make it up the major climb without having to get off and walk. I know I’d have a lot of training to do to accomplish it. Just like the Boilermaker 2013, I will have my rematch. Great job! Next time I’m in.